I'm fully embracing fall and all of its wonderful trends, but I'm also trying to squeeze in every last bit of wear out of my skirts and dresses! Besides gradually switching over to a fall color palette, I've been transitioning all of my pieces with my accessories! Booties and scarves are my favorite way to achieve this look (I'm a huge fan of both if you can't tell). I have to admit, this is one of my favorite transitional looks to date, and it's perfect for work, which is always a plus. Don't forget to enter my Stella & Dot giveaway! There are still a few days left + there will be two winners! Love the boots! Love the bag! Love the whole outfit :) and I adore Target. 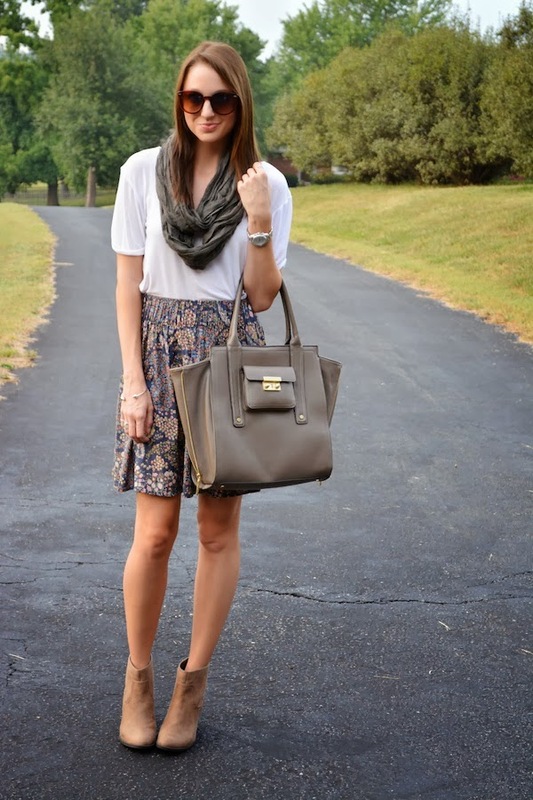 Hi Jacy, your skirt is the prettiest and I love the savvy styling with the scarf and that amazing statement bag. I appreciate you taking the time to stop by...Have a great Friday! Cute fall look, the crisp white looks great with this too. Really cute Jacy! I love the skirt, the boots and that Philip Lim bag! Great look! I am loving this outfit!! The color of your bag with the booties and detailing in the skirt is perfect. I love all the pretty muted colors in this look–that skirt is killer!